Here's a recipe that will curb any sweet craving without feeling completely guilty since you're getting some fiber and beta-carotene. In the bowl of a stand mixer fitted with a flat paddle beat butter on high speed for one minute. Reduce speed to medium, add in sugar ½ cup at a time and beat for 10 minutes until light and fluffy – don’t skimp on the time! Reduce speed to low. Add shredded carrots ½ cup at a time and egg, beating until well incorporated. Scrap the side of mixing bowl frequently. Keeping the speed on low, alternate, adding the flour mixture and sour cream to bowl. Mix until just combined and smooth. Pour batter into prepared pan, spreading evenly. Bake for 70 minutes or until a tester inserted comes out clean. 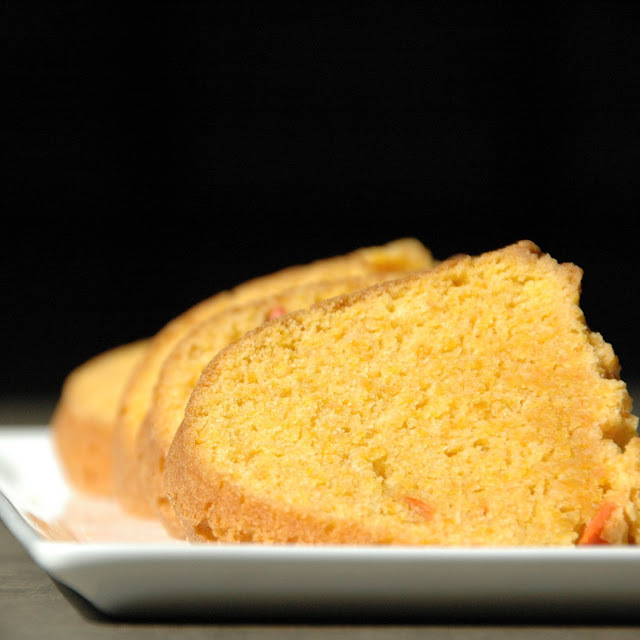 the pound cake looks great. I love the user of carrots and sour cream.